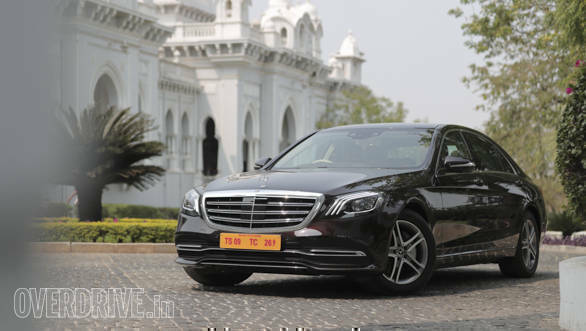 Mercedes-Benz launched the new face lifted S-Class in India in end February, and recently we were invited to drive and experience it in Hyderabad. At the unbelievably majestic Falaknuma Palace that is now one of the world's finest luxury heritage hotels. One could not ask for a better setting to be introduced to what is also referred to as the world's best car. The night before getting into the S-Class, Mercedes-Benz hosted a dinner for us at the Falknuma Palace's '101 Dining Hall'. This is the world's largest dining hall with seating for over 100 people on the table! The stately venue which was once home to the Nizam of Hyderabad, back then the world's richest man, has sophisticated wood interiors and ornate crystal chandeliers, and exquisite acoustics that enable you to hear whispers from one corner of the room to another. Watch what you say Bob, watch what you say. After a splendid evening and a comfortable night spent in the palatial room, I finally got into the new face lifted Mercedes-Benz S-Class next morning, and promptly fell asleep. No not behind wheel- the Mercedes-Benz Attention Assist system that alerts drivers when they begin showing signs of sleep, wouldn't allow that, nor would the several other driving aids that this super luxury car comes equipped with. As I was sharing the Mercedes-Benz S-Class with my friends Ishan Raghava and Kapil from Auto X, I decided to get into the backseat and before I knew it, my consciousness had been suspended. Mind you this was at 9.00 a.m, after a full night's sleep! I did not have a hangover, and neither was I suffering from any aftermaths of the night. It just kind of happened by itself. On getting in, I electrically reclined the rear seat to its maximum angle of 43.5 degrees, which thanks to the 'Chauffeur Package' also resulted in the front passenger seat moving forward. Its backrest folded nearly fully and the retractable footrest mounted below the seat, also extended automatically, making it possible for me to virtually laze in an almost horizontal position. The moment my head touched the soft pillow attached to the headrest, my mind went into retreat and I passed out. Next thing I remember, I had drifted off into a dream. In the dream I was an extremely rich man, someone who could afford all the goodies and pleasures of the world. Then a window opened and showed me the reality of this 'wondrous world'. All that money had me working constantly to invest and make it grow. The more I made, the more I wanted, such is greed. My businesses kept me very busy and I was always tired and really pressed for time. I hardly ever enjoyed my wealth and spent a lot of time travelling and also sitting in traffic. At this point, the dream turned sour, and as I woke up with a start I thought I heard Nusrat Fateh Ali Khan singing Aafreen, Aafreen. It was Ishan playing his favourite Sufi songs on the Mercedes S-Class's Burmester surround sound system with 13 high-performance speakers and a total power output of 590 watts. As I experienced and enjoyed the various massage functions, my mind moved into a different space. I was able to switch-off from all that was happening outside, and gradually felt my body and brain begin to relax. As the stress was released I started to feel lighter and imagined I was floating. Ishan's smooth driving and wonderful collection of Sufi songs with greats like the Sabri brothers was also helping soothe my mind and heal the body. I was experiencing total relaxation and found myself in a very welcome and peaceful space. The amazingly comfortable ride quality and well insulated and isolated passenger compartment, helped me achieve a much desired, but rare meditative mindset. It was like being in my own private spa on wheels. Oh, such are the pleasures of being really rich. Yes, if I was a rich man, I would surely get myself the new face lifted Mercedes-Benz S-Class. For the simple reason that I would also have my very own spa. A spa that provides half a dozen different kinds of massages. These days everyone wants to go on a 'spa-holiday'. I would just get into my Mercedes-Benz S-Class and ask the chauffeur to take me for a drive, where I would of course also get rejuvenated by the various massages. For thousands of years, spas have been known as places where you can relax and get healed. Kings and warriors, queens and concubines, Romans and Indians have all enjoyed the pleasures of massage for centuries. But at last, after having lost count of the number of cars I have driven and tested, I have finally come across an automobile, which can also double up as a spa. 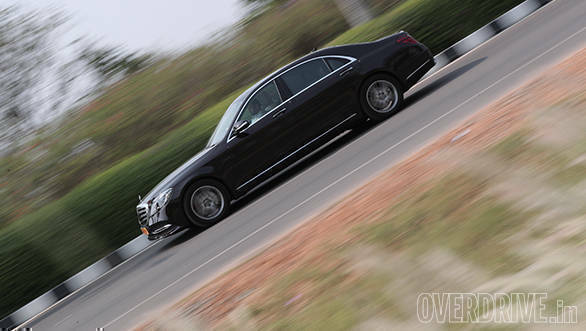 The new face-lifted Mercedes-Benz S-Class is no doubt a fast and very capable machine with remarkable performance. But to me what's more important is that it offers six different massage sessions that allow you to slow down and de-stress. Man has known for a long time and even medical science has proved that body massages improve blood circulation and deliver oxygen and nutrients to our cells. They stimulate our systems and take our body and mind into a feel good space. 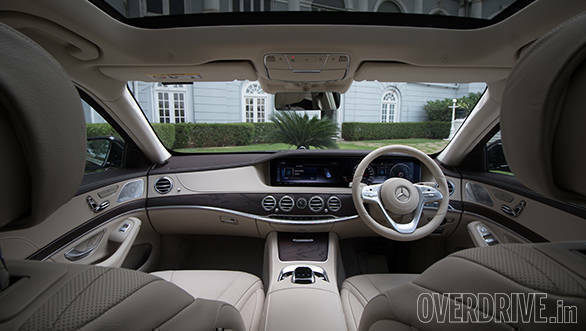 The physical pampering presented by the S-Class reduces stress and assists in slowing down the heartbeat rate. It relieves aches and pains and boosts your mood. The Mercedes-Benz S-Class even has warming effects based on the principle of hot-stone massage. It is believed hot stones warmed by fire were originally used by Native Americans to relax stiff muscles. Modern day therapists have also been heating and placing smooth flat stones on specific parts of the body, to ease tense muscles. The heat helps increase blood flow and lessens muscle stiffness. It's also said to have a sedative effect, which I can vouch for, especially after having experienced a trance like state in the rear seat of the S-Class. In case you already haven't fallen asleep, and are the kind who wants to know some details about what's different in this new face lifted Mercedes-Benz S-Class, please read-on. Being a face lift means it has new bumpers and lights and a different front grille and alloy wheels. The headlights now also sport a cluster of three LED lights strips, which is the maximum found on any Merc, and this helps establish the S-Class at the top of the Mercedes-Benz hierarchy. 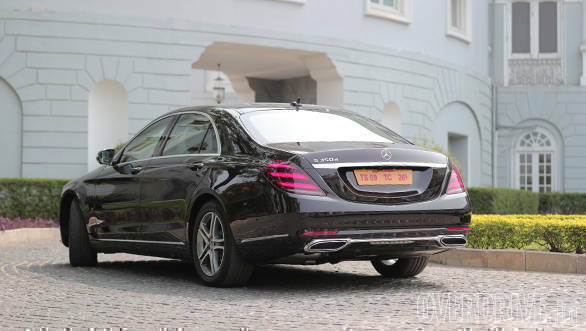 The new 2018 Mercedes-Benz S-Class 350 d is priced at Rs 1.33 crore while the petrol version S 450 costs Rs 1.37 crore. The fact is that the Mercedes-Benz S-Class is one of the best cars in the world, and anything that is this good, comes at a price. After this drive experience, to me the S in this Mercedes-Benz stands for 'spa'and I know it's a car I can definitely sleep and dream in.